Try as I might, I almost didn’t get this post out tonight. Oh, hey, that even rhymed. But really though, this little dog of mine was driving me absolutely up a wall. Every time I sat down and started typing, he would come over, climb all over me, bark in my face, run around, and throw his ball at me or drop it on my laptop. I imagine this must be what it is like to have children. I finally shut him up by filling up his treat ball with Smooches (yes, that’s really what they’re called) and he’s now busily rolling it around and eating. Fingers crossed he falls over and passes out soon. Anyways, what I’m actually supposed to be writing about is BOOKS! Yes, yes, I know, some of you aren’t the biggest fans of my book posts, but I think this one you can get behind. Mostly because there are more books out there than just fiction, YA, and chick lit. Things like cookbooks, memoirs, biographies, graphic novels, business books, self-help books… the list could go on and on forever. And because I know everyone reads one type of book or another, I thought you might enjoy hearing about how I get books for FREE. Yes, free. Now a couple of caveats before I dive in – these services cater towards those who leave reviews, mostly book bloggers. While I may blog, this is definitely not a book blog and I rarely leave reviews anywhere besides here because… why bother? I just don’t have the time. Regardless, I still manage to snag some good ones like Veronica Mars, Michelle Phan’s Makeup, and The Rosie Effect, which means you can too. And here’s how I do it. Blogging for Books – This is a pretty new one, I believe I first heard about it 6 months ago and signed up right away… then promptly forgot about it. Oops. I did just request my first book last month and received it a few weeks (yes weeks) later. I ordered Michelle Phan’s Makeup and I can’t wait to dive in. The way it works is you order a book, read it, then review it. Once your review goes through, you can request another. NetGalley – I LOVE NetGalley. I’ve received some of my absolute favorite books ever from them. Me Before You, The Girl You Left Behind, The Rosie Effect, Mr. Kiss and Tell (Veronica Mars #2) and The Storied Life of A.J. Fikry have all come from NetGalley. How it works is you sign up, fill out a profile, then start requesting advanced reading copies (ARCs). I usually have these sent straight to my Kindle App on my iPad. I had a hard time when I was a new blogger getting many “hot releases” but as my blog grew so did my acceptance rate. I will caution you, it’s addictive, so be selective in what you choose. I may or may not still have 100+ books left to read and review…Eek! Edelweiss – Edelweiss is very similar to NetGalley, but is targeted more at librarians than reviewers and bloggers in my experience. Some of their website is a little confusing, but once you sign in, click on the “Review Copies” tab and dive in. I find that these books often have a shorter expiration time and you cannot send them to the Kindle App, but can read them on a Kindle. I use Bluefire to read them on my iPhone/iPad, and I find it’s buggy and have received many books that would crash the app. I would recommend only selecting books you really want to read in the next 30-60 days, as you may go back to read them and find out the license has expired. LibraryThing – This one is a bit more like a “lottery” where you enter to win review copies. I’ve only received 2 books from them in the last year or so, but it’s nice because you do actually receive hard copies unless it states otherwise. When you read the book, you’re supposed to review it using their website. Goodreads FirstReads – I’m sure if you’re a Goodreads lover, you’ve seen the Giveaway section by now. Did you know the goal of this program is to actually get reviews and it’s not quite a lottery? They select you based on “randomness, site activity, genre of books on your shelves, the current phase of the moon, and more.” Interesting, right? I’ve won quite a few of these, and it’s fun because sometimes the authors send personal notes or signed copies. Anyone can win, but obviously the more active you are, the better your chances. I’ve never used either of these, so I can’t comment on them from experience, but both seem like great options to try. Bethany House – With Bethany House, you’re required to both post on your own website or blog, plus a retailer site like Amazon, Barnes and Noble, or Christianbook.com. It seems like there is a focus on spiritual books, but based on past book lists seems like there is a variety. Tyndale Blog Network – This is the same format as Bethany House – receive a book, blog about it, post on a retailer site, then receive another book. Wash, rinse, and repeat. If that’s not enough for you, stay tuned! 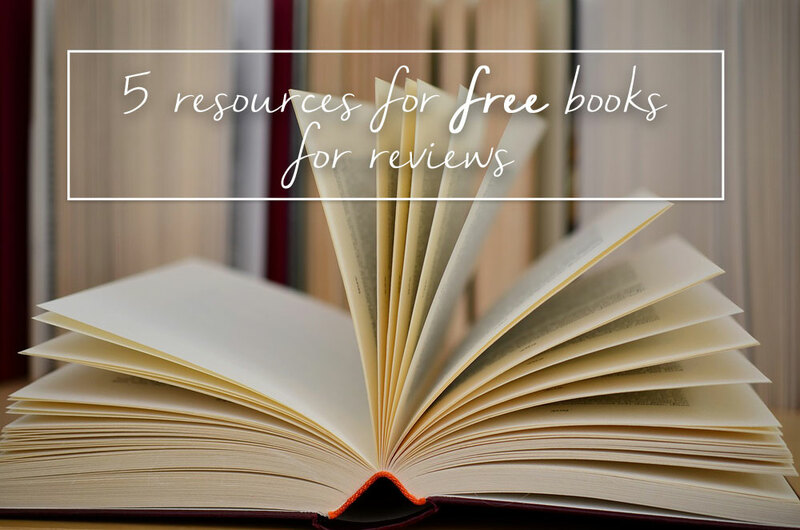 Next week I’ll be posting about some other resources for totally free, no strings attached books! Have you tried any of these services? Which one is your favorite? Or did I miss one of your favorites? I’d love to hear about it! I always get your posts checking my email before bed, and well they always look good so here I am:-). I for one love your blogging posts and have only heard of one of those services so this has been a gold mind. Thanks!! Perhaps if I join these, I’d be more inspired to finish reading my books, eh? Thanks for sharing, Jenn! Free books?! Yes, please. Signing up for all of these! Awesome, hope you find some great new books, Chelsea! I haven’t tried Blogging for Books or NetGalley, so I am definitely signing up for those. I really like GoodReads First Reads and the Penguin First to Read program. I like the Penguin program because if you get enough points, you can guarantee copies. NetGalley is my fave, I feel like they’re the holy grail of eBooks. I haven’t tried Penguin’s First to Read, I’ll have to check that out! Haha oh no! I hate when I do that… I have a few I requested in NetGalley that I wish I hadn’t. Oops! I love these! I have a Blogging For Books book that I need to review (I haven’t read it yet) and I can’t wait to do it and get my next book! I love the idea of free books…it’s so smart! It really is! I need to get to reading and reviewing my book from Blogging For Books too! I am a fan of blogging for books, I have tried a few others but can only manage to keep up with one at a time. I had no clue good reads had that feature available. That’s smart, I got a little overzealous and signed up for too many. It can get overwhelming quickly! This is such an informative post! I love NetGalley too and keep seeing Blogging for Books but haven’t signed up yet, but think I will now! I definitely enjoy your book posts :) I love Blogging for Books and NetGalley. Although when I first signed up for NG I didn’t realize I would get quite so many titles approved, so now I have a huge backlog…oops! Glad to hear it! I like them too. ;) I had the same problem, and that was over a year ago and I’m still paying for it. Oops! Yes! I am definitely going to have to save this post on Blogloving AND pin it! lol! I’m really excited to look into some of these. Thanks girl! I love your book posts; don’t stop writing them! :) This is great. I just got my first book from Blogging for Books (Silver Moon by Kenneth Calhoun) and am loving the break from my typical YA Lit. I am going to look into Netgalley! I just found out about booklookbloggers, which sounds like it is similar to Bethany House! I’m going to have to try Book Look Bloggers, but definitely join NetGalley, it’s by far my fave. I love using Blogging for Books! I’m enjoying it too – it’s fun getting a hard copy to read! NetGalley is my favorite. I think it’s Blogging for Books that’s hard for me because you can’t get another until you’ve reviewed what you have. I got a doozy that I didn’t want to review, so I emailed them after my account expired and they took the book off my account. I didn’t like that they didn’t make that kind of info readily available on their FAQs… but other than that, they have a good selection! I tend to over ask for NetGalley books and have way too many to read because I think everyone will turn me down. I didn’t realize that the Goodreads giveaways worked like that! I’ve only entered one or two, but I try to be active on the site and leave reviews! I love Blogging for Books. I haven’t set up my NetGalley account yet (lazybum) and I don’t remember the last time I won a book via GoodReads, but I haven’t heard of a few of these so I’m gonna check them out! Yeah, I haven’t won any in awhile, but I also enter way fewer since discovering all of these free books. Definitely finish your NetGalley account, they have some really great new titles! I can’t wait to give some of these a try, I am always looking for free books. I have Netgalley but, despite following the directions I can’t open the files on my Nook HD. It seems a lot of sites are geared towards Kindles and I wonder if I should buy one soon because I can never seem to get books from Netgalley and the likes on the Nook. Oh no! I have no idea about Nook, I’m guessing the formatting is probably quite different and thus the issues. I tend to read a lot of books on my phone on the go, maybe you could always try the Kindle app first? One funny thing about Blogging For Books: They might send you random, unsolicited titles. Or that happened to me once, at least. I’m not sure how if it was based off my genre interests or location or what, but I got a random mystery/crime novel in the mail one day, which seemed sort of odd because I had only requested titles related to cooking before, hah. That’s super funny! I have yet to have that happen but it sounds like it could be entertaining! This is really interesting! I don’t see myself ever really becoming a book blogger, but still – it’s nice to know that there’s an option for some free reads if I ever decide to go down that path. Now … if only there was a similar type service for fashion bloggers with clothes and outfits …. haha. Oh thanks for sharing! This is right up my alley! Of course, glad you liked it Kay! I love this list! I use Book Look Bloggers. Their selection is limited but sometimes they have great finds! I’ll have to check that one out, thanks Cassie! Great resources! I loved it, I love books too! Nice! I’m definitely going to try at NetGalley! Thank you!!! This is a much needed post. I wanted to get back into reading but don’t really have the money for lots of books. I usually find free books on Amazon or iBooks. Now I have two more sources with a better selection!